I love the way that you've suffused Nefertiti's classic features with rapt wonder. Пролистал комментарии к работе, не заметил подобного, поэтому позволю себе немного критики с вашего позволения. Your welcome. 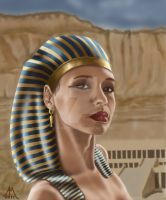 I love your picture of Nefertiti. Hello from Egypt! This is a beautiful picture! Your work is amazing, been browsing your gallery. I loooooooooove it! It's a light bulb! Great work! Cool manip. Thanks for using a bit of my stock. Thank you!I am glad that it is pleasant to you!